Negotiating the fall of worlds. Before reading this review catch up on Infinity here! Cover- Green is Infinity’s color this month and it does look super cool on the stands! Thor, hammer held high with lightning swirling around him is the order of the day. Tragedy-Thane undergoes Terrigenisis and kills everyone he has ever known. This former healer and son of Thanos is shaping up to be quite the dysfunctional hero/anti hero/villain. One god knows what happened to his mother, his father wants him dead and he’s now lost everyone he’s ever known? Yikes! Action- Infinity has some mighty fine action scenes and this issue Thanos and Black Bolt throw down in the ruins of the Inhuman city to great effect. Every blow had weight; Thanos’s rage was palpable as was Black Bolts determination. Art-two distinctive styles one for earth, one for space, both perfectly fitting. Inhumans- Hickman has managed to renew my interest in the inhumans in a big way. While War of kings was intriguing because of Crystal’s marriage to Ronan and their taking over of the Kree and defeating the shiar empire. Hickman has grounded the race on Earth and managed to add so much depth and history in the Infinity line of books that I’m dying to see, hear and learn more. Story- Captain America rallies the Galactic council while the builder on Hala makes plans to broadcast their surrender throughout the galaxy. On earth in the hidden city of Orollan five disparate being undergo terrigenisis with a small fragment of the terrigen crystals. In New York at the site of the terrigen bomb and the destruction of the inhuman city those with Inhuman genes start undergoing terrigenisis immediately. 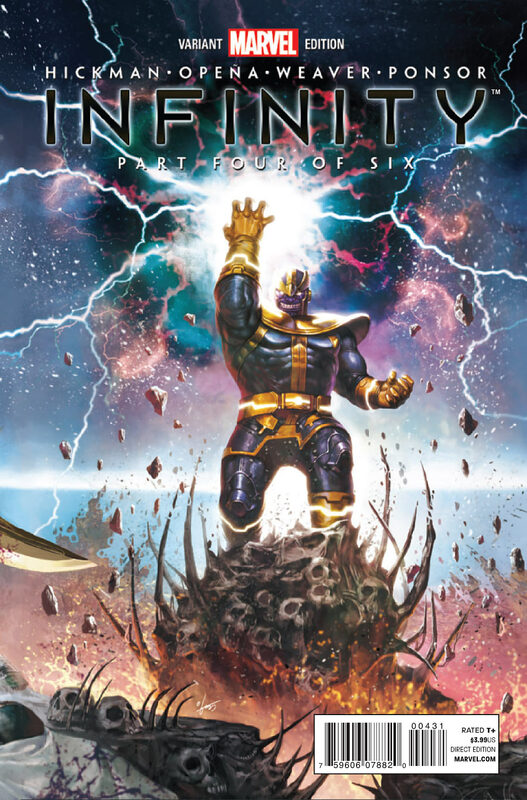 In the ruins of the inhuman city Black Bolt and Thanos survive and start a fight. Black Bolt battles valiantly but Thanos defeats him. In Orollan the terrigen mists hit the city and activates the latent powers of Thane which kills everyone in the city. In space Thor is sent to negotiate the surrender of the council. Thor of course kills the builder, brings the kree back to the council and thanks to the builders broadcasting what took place everywhere guarantees that their army will grow. Cool- By now everyone has heard or at least seen Thor toss his hammer in a sun, retrieve it and then kill the Builder. This is one of those comic book moments where the art and story blend so seamlessly and create the one perfect moment that readers will be talking about for the next decade. 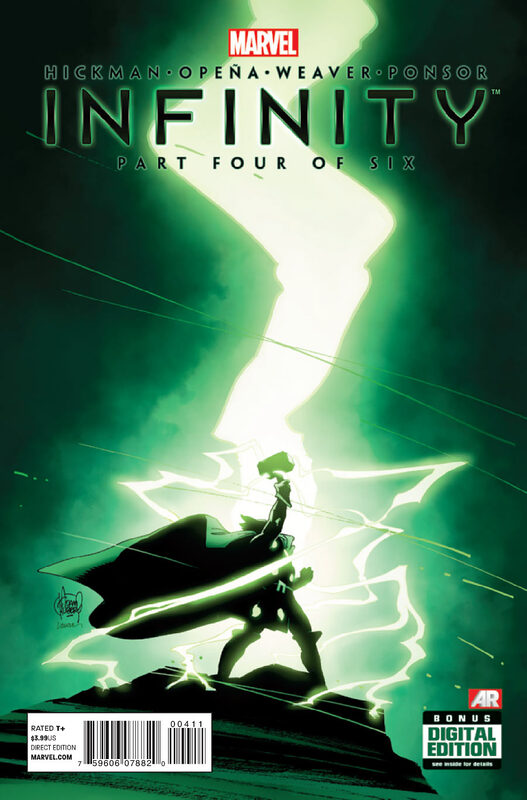 Infinity #4 is emotional, action packed, top notch event book. It has a certain pick up and read it charm but has so much depth if you’ve been reading Hickman’s New Avengers (2013) and Avengers (2013). . Not reading Infinity? Shame on you! ← Spawn Movie Reboot On The Way!